Order within 1 hour 1 minute for Same Day Delivery! 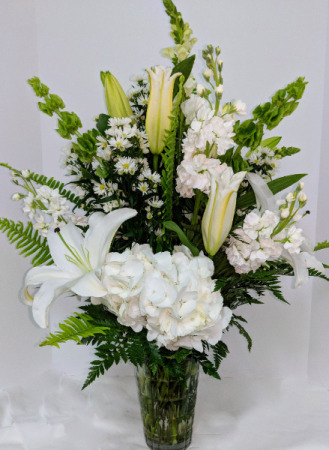 Bring the wintry wonderland indoors with an arrangement of all white flowers. These crisp blooms will make any home feel as though it's been kissed with snow. 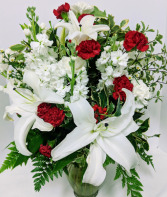 Put stars in their eyes with this floral arrangement of joyful whites and bright holiday reds. 'Tis the season of sharing! 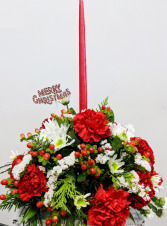 Bring a little glowing warmth to your home this season with a Christmas centerpiece. 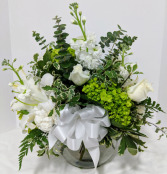 At The Flower Cottage & Gifts we make ours with fresh flowers and winter greenery and can include 1, 2, 3, or no candles. All Delivery cut-off are at 12 Noon during Expect Saturdays the cut off for Same day deliveries is 10:00 a.m.